June | 2014 | Eat. Craft. Love. ..to see the senoritas with flowers in her hair! Does anyone remember that old childhood rhyme? I forgot whether it was a hand clapping game or one where it was a bunch of kids dancing in a circle, but it included lyrics that went like “shake it shake it shake it, shake it all around..” My guess is that perhaps its the latter–a dancing in a circle type of game. Then that got me thinking, as a kid, I learned these little childhood games from my playground friends. Do kids still pass on games like this anymore or are these things now obsolete? Should I have written down these little playful games so they can be passed on? What do kids do now in the playground? 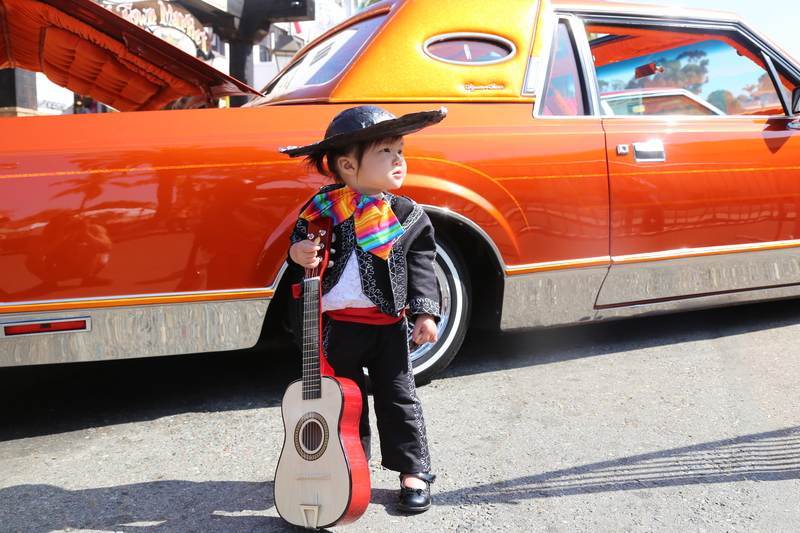 One tradition that we hope to continue with our kid(s) is to attend the annual San Diego Fair, formerly known as Del Mar fair. We took Kyla last year when she was about 6 months, and although it was fun, it wasn’t nearly as rewarding as it was this time around. Kyla curiously petted the cow, stared at the award winning bunnies and guinea pigs, thoroughly enjoyed some corn on the cob, bravely rode the pony, and shook it shook it shook it to some lively gospel music. It’s an awesome pop-up tent that goes from a compact 18″ circle to a generous sized tent to provide instant shade from the harsh sun. There are pockets where you can add sand to weigh it down from the wind or you can pin it down to the ground (ie grass) with some spikes. Kyla and I laid inside the tent while daddy Lawrence got his tan on outside the tent. Perfect. Kyla then had some beach fun by happily dipping her toes in the water and stomping her feet in the sand. Happy Father’s Day to all the wonderful dads out there who have sacrificed so much to raise their sons and daughters. And a special happy Father’s Day to the single moms out there who have played the role of both parents. Kyla’s outfit this month is dedicated to Father’s Day. I had Lawrence pick out an outfit that he wanted to wear on Father’s day and made a matching corresponding outfit. Lawrence picked out a white dress shirt and a matching blue with white polka-dot bow tie that he got from Banana Republic. I found a blue polka with silver polka-dot cotton fabric that was similar to Lawrence’s bow tie, but decided to make Lawrence a bow tie as well. I found a pretty simple bow tie pattern thanks to Sew Like My Mom: (http://sewlikemymom.com/mens-bow-tie-tutorial/). The outfit turned out pretty good! But eventually she warmed up and the Father’s Day photoshoot turned out really well. Lawrence fell into the “model” role because as we stopped by a couple stores after the photo shoot, I found myself carrying everything including Kyla, my camera, and my props bag, while Lawrence was strutting around empty handed. When I asked Lawrence for some help he said “Oh I thought I was still playing your model.” Haha. Oh Lawrence. Every month so far of Kyla’s life, we’ve been taking monthly pictures of her. After she turned 1, Lawrence wanted to continue taking monthly pictures but I was a little hesitant. How much do toddlers really change over time? Besides us, who will really care about these pictures? Can we really commit to remembering to take pictures every month for another year? We both work full time, when will I have time to do this? But one idea kept me interested: I can take themed pictures of her every month! So far we are 5 for 5 with this monthly themed picture process. As the year gets busier, hopefully we can keep up with what we signed ourselves up for! Day off today for Kyla’s allergy appointment. After a morning of waiting at the doctor’s office, being skin pricked for allergy testing, and poked by needles for blood draws, I decided to take her to the beach for some fun and a quick photo op. Kyla is allergic to eggs, dairy and nuts and it’s been a challenge to find things for her to eat sometimes. But challenge accepted! Kyla LOVES her blueberries. Since it’s blueberry season, we have a surplus of blueberries in our house (hello $3 for 18 oz sale!). I decided to make blueberry muffins and tweaked this recipe (http://www.inspiredtaste.net/18982/our-favorite-easy-blueberry-muffin-recipe/) to make it egg-free and dairy-free. This recipe is simple, uses common pantry ingredients (except the chia seeds), and doesn’t take too much prep. 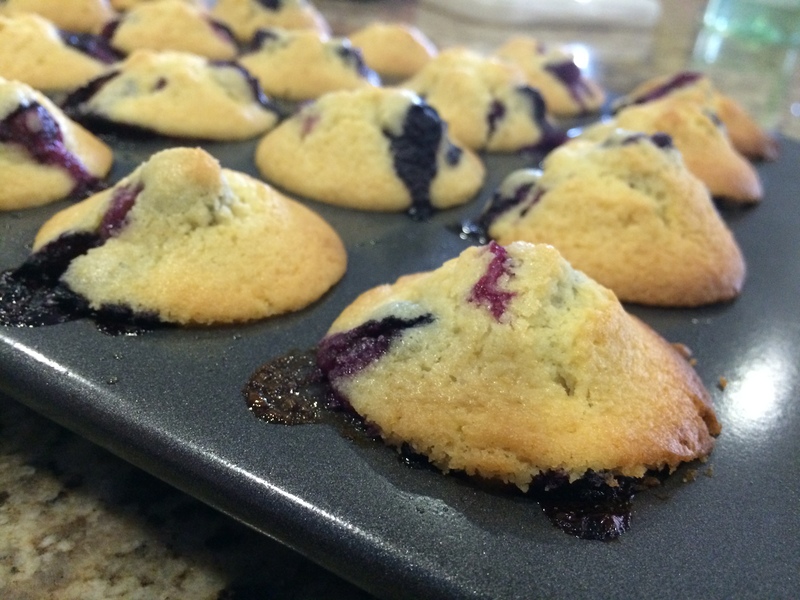 I found using mini-muffin pans yielded the perfect hand-sized muffins for a little toddler. Preheat oven to 400F. Spray mini-muffin pan with vegetable cooking spray (you may also use cupcake liners). Combine flour, sugar, baking soda, salt, together in one bowl. In a separate bowl, mix oil, chia seed mix, milk, and vanilla extract. Combine the wet ingredients to the dry ingredients. Make sure to not overmix. Then add blueberries and fold to evenly distrubute. Spoon into each muffin pan and sprinkle sugar on top of each muffin (optional) and bake for 15-20 minutes at 400F. The tops of the muffin should be lightly brown when done. Finally, we did it. We created a BLOG! I’ve always wanted to create a blog with every different phase in my life. For example, I had my high school/college/pharmacy school Xanga days, when Xanga existed. Then I posted a few blogs during my time in Hong Kong studying abroad. Then again during my “foodie” days, and again during my time living in NYC. Needless to say, I never committed to any of them. I guess partly because those phases were short lived, and I just sucked at keeping up with them.